Serving Olympic Karate in the United States as part of the USA National Karate-do Federation. Members of the Masters Caucus at a recent meeting in Las Vegas - Ed Kuras, Sam Justice, Roger Jarrett, Chairman Patrick Hickey, USANKF Director Luke St. John, Bill Damon, Minobu Miki. Members of the Masters Caucus with USANKF President John DiPasquale and foriegn dignitaries. Hanshi George E. Anderson founded the USA Karate Senior Master’s Caucus with the approval of the USA National Karate-do Federation, the National Governing Body for Olympic Karate in the United States. Hanshi Anderson’s vision was to create a body where Senior American Karate-ka could meet and participate in the activities of the Olympic Karate movement and have their contributions to this movement recognized. The Senior Master’s Caucus does not have a role in the direct operation of the USANKF but does make recommendations to the USANKF and provides support for USA Karate activities. 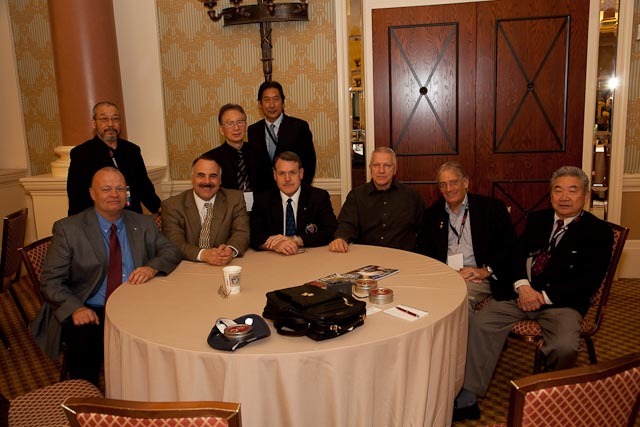 The Senior Master’s Caucus allows the karate masters to be a part of USA Karate and gives USA Karate the ability to tap the vast resources and experience of senior karate-ka without involving them in everyday operations. 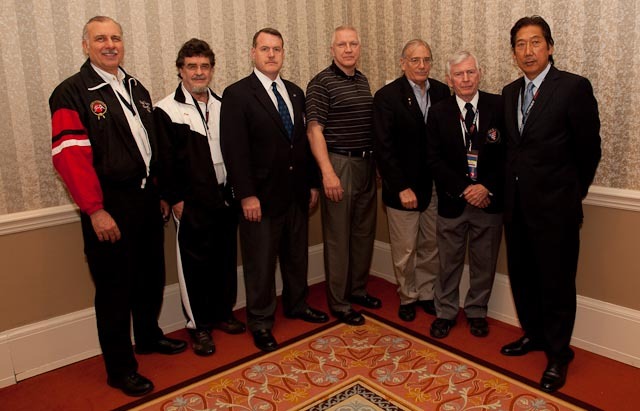 All Senior Masters Caucus Members are Life Members of USA Karate. · To recognize and represent the views of the high-ranking masters within the Unites States. · To give elders and seniors karate-ka a role in developing and maintaining the values and traditions of historic karate. · To periodically provide the Executive and the Board with a clear and understandable report on observed anomalies, inconsistencies, biases, and unproductive bickering in general. Hanshi George E. Anderson 11/25/1931 to 8/6/2009 Hanshi Anderson is generally considered as the founder of the USA Karate Olympic Karate movement in the United States. He, along with Patrick Hickey and Thomas LaPuppet Carroll marshaled the AAU Karate program into a full-fledged National Governing body. Hanshi Anderson, in addition to being president of this movement, was also president of the Pan American Union of Karate-do Organizations (now PAKU) and the chairman of the World Union of Karate-do Federation?s (now WKF) referee council later on becoming vice-president of that organization and being involved in the WUKO?s transition to the World Karate Federation. His involvement in the USA Karate movement included being on the United States Olympic Committee (representing karate as well as other sports) and he is generally considered responsible for getting the sport of Karate on the program of the Pan American Games as a medal sport. During his tenure with the WUKO, he also held the first World Technical Congress on sport karate which assembled and redrafted the rules of karate competition. Thomas La Puppet Carroll Thomas La Puppet Carroll was a well-respected and principled karate man. Thomas Carroll LaPuppet born in South Carolina in 1938 died on March 23, 1999. Considered by some to be an American Martial Arts Pioneer. He defeated many famous martial artists including Bill "Superfoot" Wallace in tournaments. He also trained actors Gregory Hines and Ralph Macchio of Karate Kid. He is considered to be a contemporary of the cerebral Chuck Norris and Joe Lewis. He served as treasurer for the USA Karate Federation, the first USOC recognized national governing body for karate. In addition to serving as treasurer, he was a recognized official, member of the USA Karate Hall of Fame, chairman of USA Karate New York a head coach of the USA Karate national team and involved with the US Jujitsu Federation. Carroll was born in South Carolina in 1938, but was raised in Brooklyn, NY. Graduating from Franklin K. Lane High School, he then went on to attend the State University of New York in Westbury, NY. While not graduating from there, due to his belief that "The University of the street" provided a more dynamic education. Thomas Carrol worked as a Firefighter for the FDNY and was also in the United States Marine Corps. He was a member of the Prince Hall Masons. An 8th degree blackbelt. He appeared in the movie Angel With a Kick as well as The Super Weapon[He acted in the 1976 movie The Super Weapon, which also starred Ron van Clief. He was also in the movie Angel With a Kick. Masaharu Sakimukai Soke Sakimukai established Chintokan Karate-Do. Soke devoted his life to living and teaching the Japanese martial arts way. He was first introduced to Judo by his father at very young age and he began his formal karate training at age 13. In 1962, at age 19 he established his first Chintokan dojo in Osaka, Japan. After expanding to nine Chintokan dojos in Japan, in 1980, he moved his family to the United States. Within six years, he quickly became a prestigious International WUKO Judge. As an International WUKO Judge, Soke supported the International Karate-Do competitions worldwide for many years. He also practiced and taught Iaido and Jodo and held 9th dan, 'Hanshi' title for both arts. He received Menkyo Kaiden from Mugai Ryu Iaido and Menkyo from Jodo. Patrick M. Hickey Hanshi Patrick Hickey, chairman of the USA Karate Senior Masters Caucus involvement with the Olympic karate effort began in 1975. He has had both national and international referee certification, been the chief referee at numerous national championships, a national coach, instituted the coaches education committee, and was chairman of the referee council. In addition, he represented the United States at the first World Technical Congress in 1983. Hanshi Hickey was elected treasurer and the national secretary for AAU Karate and for the USA Karate Federation. Currently he is the president of the USA Karate Federation (USAKF). Ridgely Abele Shihan Ridgely Abele began his martial arts career in 1964 under the tutelage of Hanshi John Pachivas. Shihan Abele founded and directed the International Shurite Yudansha-Kai, a world-wide organization. Abele was a well-known and respected competitor, referee and coach serving as Head Coach for the USA Karate Team and later as chairman of the Coaches committee. He produced many national champions and helped many other aspiring competitors along the way. Philip W Koeppel Hanshi Philip Koeppel, founder of the United States National Karate Karatedo Kai was for many years involved with Robert Trias in the United States Karate Association ? the first national karate association in the United States. Hanshi Koeppel?s involvement with the USA Karate effort goes back to the late 1979?s. He participated on the USA Karate Kobudo Committee and is considered one of the main experts in the United States for Kobudo. His martial arts career spans over 50 years. James Mather Hanshi James Mather, founder of the United States National Karate Association, was a close adviser to the Hanshi George Anderson. He participated as a National Coach and as the National Training Director for the Olympic Training Center and is a graduate of the Elite Coaches Collage, US Olympic Training Center. He was actively involved in coach?s education. Hanshi Mather still trains and runs his dojo in San Jose. Many of his students competed on the USA Karate national team. Koji Sugimoto Shihan Sugimoto has been Teaching Shotokan Karate since 1970 currently teaching at the J.K.F. Shotokan Kenkojuku Headquarters Karate School Miami-Dade College. Shihan Sugimoto has been a World Karate Federation Kata and Kumite judge and referee as well as the Florida representative to the USA Karate movement for over 20 years. He has served as a senior technical advisor and member of the referee council. James Blann Shihan James Blann began studying karate in 1975. He is the head of the Southeastern USA Karate-do Organization. He has been active as both a competitor and coach being a member of and serving on the national coaching staff for USA Karate National team for over 12 years. In addition, he served as national Coaches Committee Chairman from 2002 till 2004. Over the years, he has been the main contact for the USA Karate effort in the Southeastern part of the United States. Terry Maccarrone Hanshi Terry Maccarronesenior student of Ansei Ueshiro of Okinawa and Long Island New York was active in the original AAU Karate program in the 1970 and now a member of the New York Traditional Karate League/ Teaching over 45 years since 1964 retired in 2009 and advises via internet the Karate USA Dojos on Long Island. Sensei Maccarrone is also New York State Representative for USKK Master Phil Koeppel, Recently traveled with Robert Yarnall to Ireland to celebrate 25 Years of Matsubayashi Shorinryu. Maccarrone also is a Board Member of the Karate Masters Hall of Fame division of MAGI His current website is www.karateusa.be. Bill Marcum Bill Marcum began training with J. H. Kim at Kent State University and is still with Master Kim?s as his senior student. Besides the University Club, Shihan Marcum manages a Pro Am Karate Studio. Marcum started in the USA Karate effort with the AAU both as a competitor and official and was at one time on the USA Karate national team. He has also been an international coach and currently participates as a National Referee. Pamela J Hickey Shihan Pamela Hickey first became involved as an athlete and official in the USA Karate movement in 1975 and continued competing and refereeing into the early 1980?s. She was a nationally certified referee, handled athlete registration and has been in great demand for her kata instruction. Currently she runs a karate dojo in Ohio and has recently become a certified yoga instructor. Bruce Bethers Shihan Bruce Bethers was involved in judo and jujitsu activities with Hanshi George Anderson as an advisor and consultant. Together they formed United States Ju-Jitsu Federation of which Bethers is president. Through these goals Bethers worked with Hanshi Anderson to expose karate athletes to other forms of martial arts competition. Bob Allen Shihan Bob Allen started Karate in 1966. He trained with the Japan Karate Association in Japan for five years and competed in 5 All-Japan National Championships. Allen was aational Champion 6 times and was thecaptain of the world team that placed 4th in Japan in 1977. He is a WKF World Referee and Judge and currently is on the technical Committee, coaches committee, and Dan testing committee. Mark Cramer Shihan Mark Cramer began his karate-do training in 1971. During these forty plus years he has trained and taught Isshin-Ryu and Goju Ryu being a member of the Seiwa Kai, the Japan Karate-do Federation (JKF) Goju Kai. Moreover, he has trained at the JKF Headquarters in Tokyo Seiwa Kai Headquarters in Omagari. He is also a USA National Karate-do Federation Certified Kumite Referee and Kata Judge. He is a former many times USA Karate National Champion. William Gary Damon Coming from a military background, Shihan Damon started karate in 1960. He opened first dojo in Wallingford, CT in 1969 after obtaining Shodan grade in Okinawan Shorin-ryu and has trained with Hidy Ochiai and Masaichi Saito and Kiyoshi Yamazaki. He was a member of Board of Directors for USA National Karate-do Federation, President, National Karate-do Federation of Arizona and a well-known and respected national and international official. Doug Jepperson Shihan Jepperson started his karate training with Ed Parker in 1966 and has trained in the Wado style since 1969. Shihan Jepperson is the founder of the Wado Conference, USA Wado Organization. He is one of the few who has received certification from all three major Wado groups currently training with Tatsuo Suzuki. In addition to operating a dojo, he has served on the USA Karate Technical Committee and participated as both a referee and coach. James A. Caldwell James Caldwell started his study of Karate-Do/Kobu-Do in Sasebo, Japan in a Sho Rin type of Karate-Do under the tutelage of Yoriyuki Yasuzato. Shihan Caldwell has served as a National Referee, Kobu-Do committee member and as Regional Chief Referee with the AAU and as chief referee with the USAKF. He also served as Chief Referee and Secretary General for the USAKF. He is also a founding member of the International Okinawa Kobu-Do Association (IOKA ). Jeung Kim Hanshi Jeung Kim was a national referee and judge for AAU and later USA Karate since 1976. He participated on the National coaching staff for many years both as assistant and as head coach. Hanshi Kim was also involved with the national coach?s education committee and sports psychology symposiums. Over the years he has had many of his students make the USA Karate national team. Brian Pendleton Shihan Brian Pendleton has studied various disciplines of the martial arts and has held numerous positions within the USA Karate effort including tournament administration, medical and coaching committees. He is one of the originators of the Therapeutic Martial Arts movement used throughout Ohio for special needs youngsters. Currently he serves as an officer of the USA Karate Foundation and is the executive director of the USAKF in addition to be actively teaching and practicing. William Bly William Bly currently works at United Nations headquarters in NYC with digital media and at Long Island. He began studying martial arts in 1975. He is the founder of the American Samurai magazine and dojo in North Carolina and was Director of Media and Communications at USA Karate until he joined the United Nations. Michael Ayers Shihan Michael Ayers has has a life-long involvement in karate and a lifetime relationship with Master Causus founder George Anderson.He has been studying and teaching the martial arts since 1983. His school is called Tsuke Kage Ryu (Moon?s Reflection.) In addition to karate he teaches Iaido, Iaijutsu and Aikido weaponsand also studied tea ceremony with Shimaoka Sensei in San Francisco. Samad Greywolf Raatib Shihan Raatib trained in the Martial Art of Shotokan Karate-do for 45 years and is well-known in the traditional martial arts tournament circuit. He is also trained as a law enforcement officer and teaches martial arts to both civilians and law enforcement personnel. A certified he has supported the USA Karate effort for many years. Lance Weimer Shihan Lance Weimer was a member of the USA Karate team and at one time was rated 8th in the World and competed at the second World Games in England. In addition to being a competitor he was a coach of the USA Karate national team. Shihan Weimer runs a dojo in Ohio and is very active promoting competition throughout the State of Ohio and works closely with USAKF team development.